Animation is the illusion of movement using a sequence of images. While today we are familiar with the expediency and awesome effects of digital animation, it took strong drafting skills and much patience to create animation historically. The Art of Warner Bros. Cartoons explores the elaborate process that went into the making of the classic Warner Bros. cartoons, considered to be among the finest, funniest, and most inventive animated shorts ever made. In addition to showings of the cartoons themselves, over 100 original drawings, paintings, “cels,” and related artworks from the 1930s to the 1960s demonstrate the step-by step development of such beloved characters as Porky Pig, Daffy Duck, Bugs Bunny, Tweety, Yosemite Sam, The Road Runner, and many others. Curious to learn more about the characters' development? Click here! A related display explores additional historical and current animation methods, from the Zoetrope to digital mediums, and invites visitors to bring their own artworks to life. 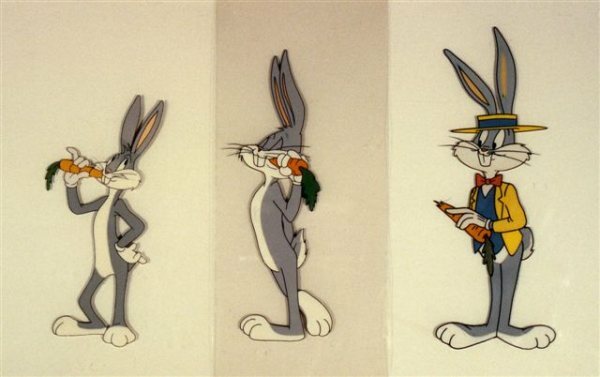 Three Cels of Bugs Bunny, artists unknown, 1947, 1952, and 1960.